Recycling containers come in varying sizes and configurations. At Friesen’s Welding, our recycling containers are designed to work for you. They come suited to your needs to simplify the hauling, loading and unloading of recycled material. They typically are constructed as a light duty roll-off. They are designed with plastic sliding or flip-over doors mounted on a “A” or “Hip” shaped roof. Dividers are placed inside the container to allow for the safe and secure deposit and hauling of various materials. Recycling containers are used for lighter garbage--cardboard, newspaper, plastic, glass and metal in separate compartments, or co-mingled. 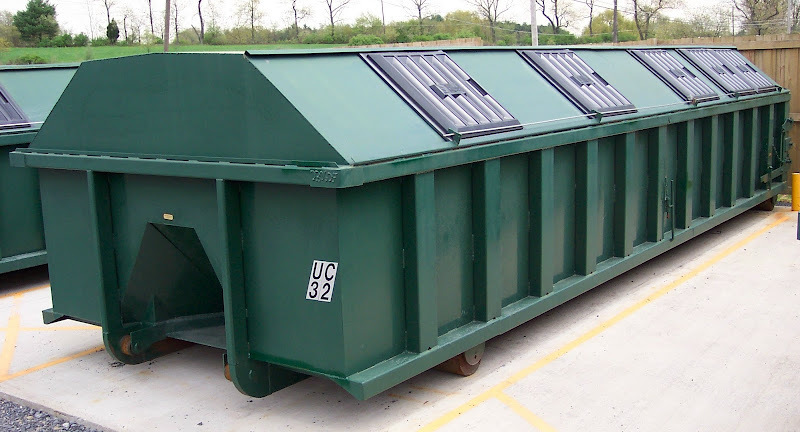 Recycling containers vary in length from 10’-22’, or from 10 to 40 cubic yards. Larger sizes are available.